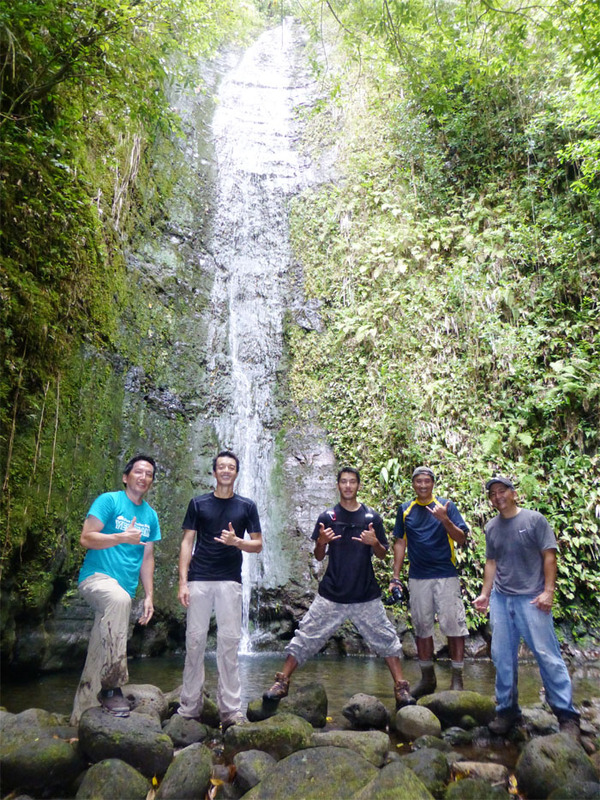 Taking a break from ridge hiking, I joined Nate, J, Tom and Glenn for some waterfall hiking in Nuuanu today. 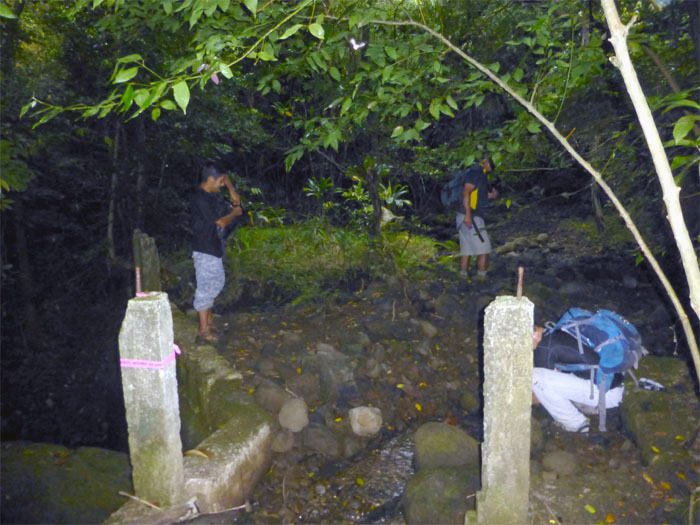 We parked at the Pali Hunter’s Check-In Station and crossed the Pali Highway to enter an un-locked gate that took us into the lush forest. As we started on the trail, I recognized dirt ninja aka Chris’s tag tied on a tree, we eventually caught up with him before the irrigation tunnel. Soon we found ourselves at the entrance to the irrigation tunnel. 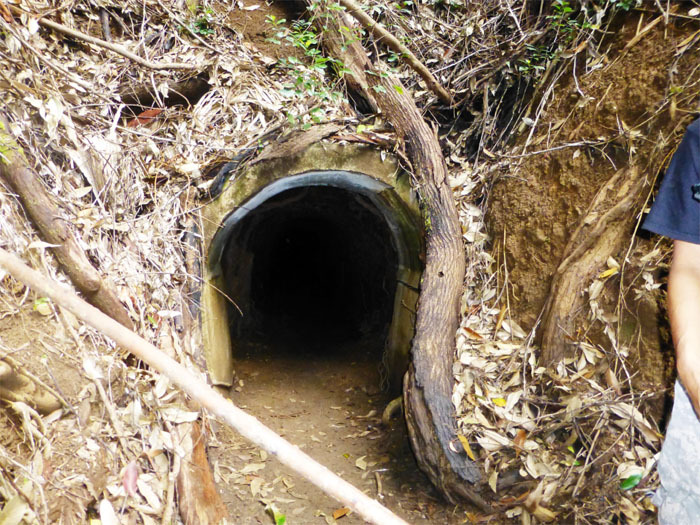 Time to break out the head lamps, if you’re claustrophobic and don’t like stooping a lot, this tunnel is not for you. 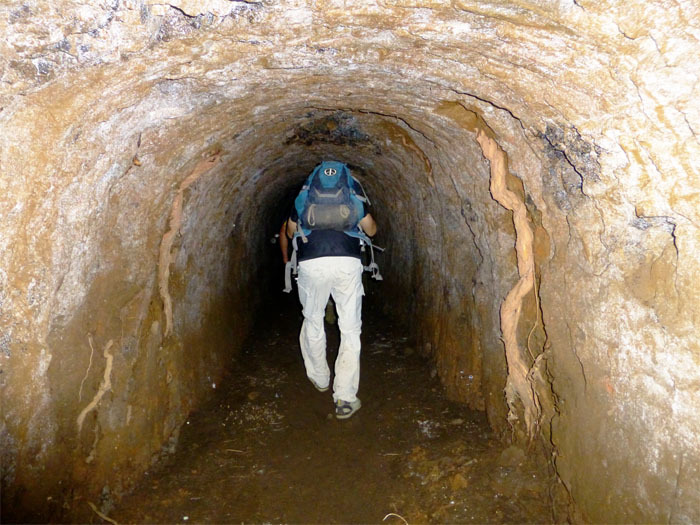 I heard there is a contour trail that goes around and above the tunnel. Walking through the tunnel, we could feel the moisture above our heads and muddy puddles underneath our feet. This was a good sign. If the tunnel is bone dry, might as well turn around. 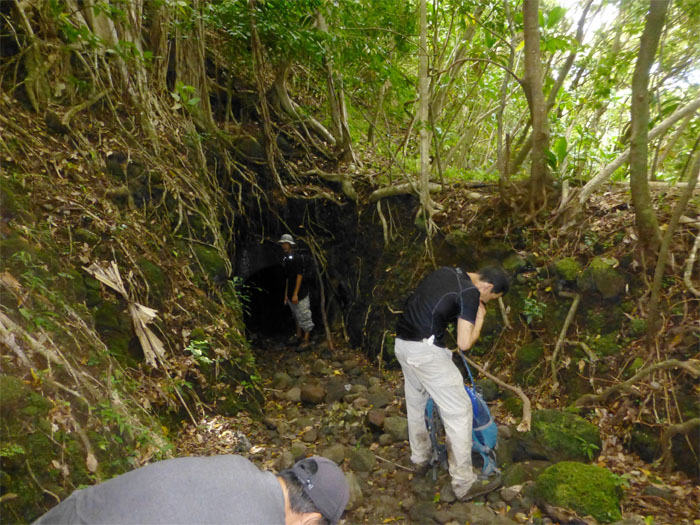 After about 5 minutes, we emerged out of the tunnel and into Mo’ole Valley or Hillebrand Glen. 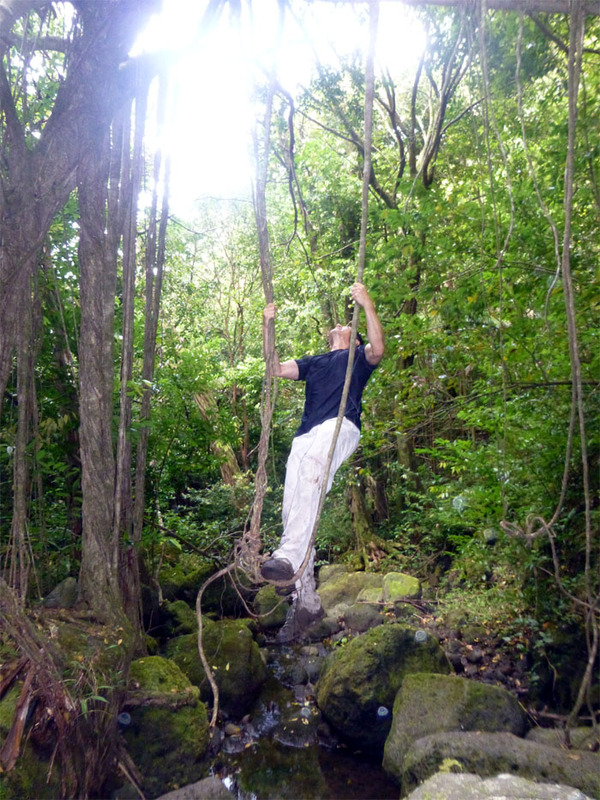 Tom swinging on some tree roots. 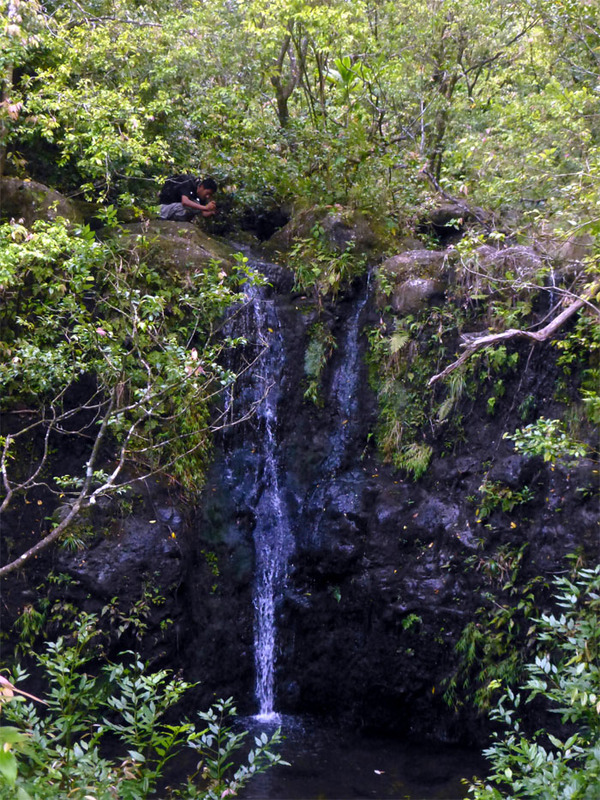 The second waterfall is the largest and most impressive of the waterfalls to be found in Mo’ole Valley. 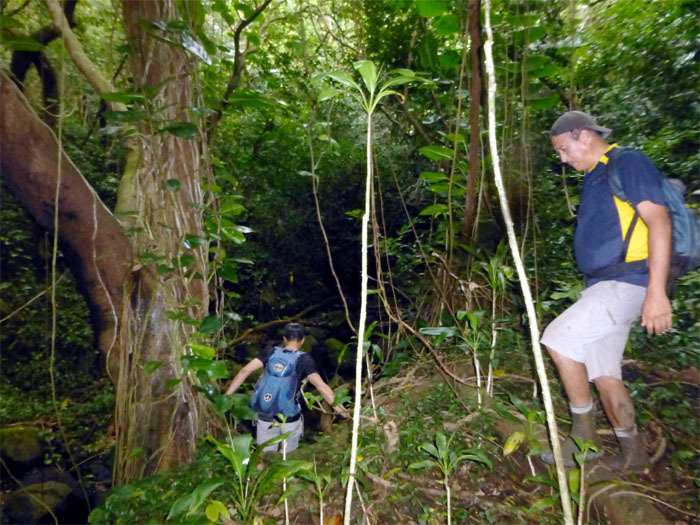 We had to backtrack a bit from the second waterfall and climbed down a trail to see the third waterfall. 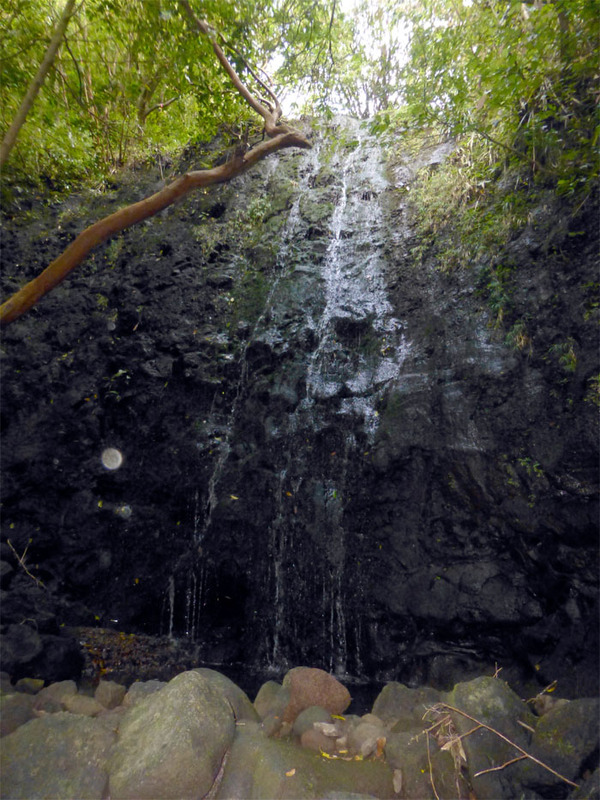 The fourth waterfall had a lot of tree branches obscuring the view. 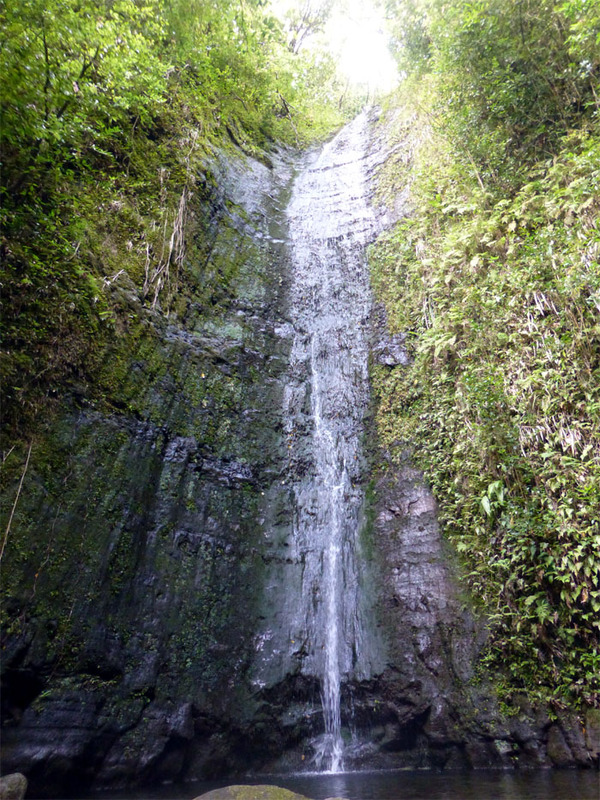 A short while later, we came upon the fifth waterfall which was a footnote compared to the others. 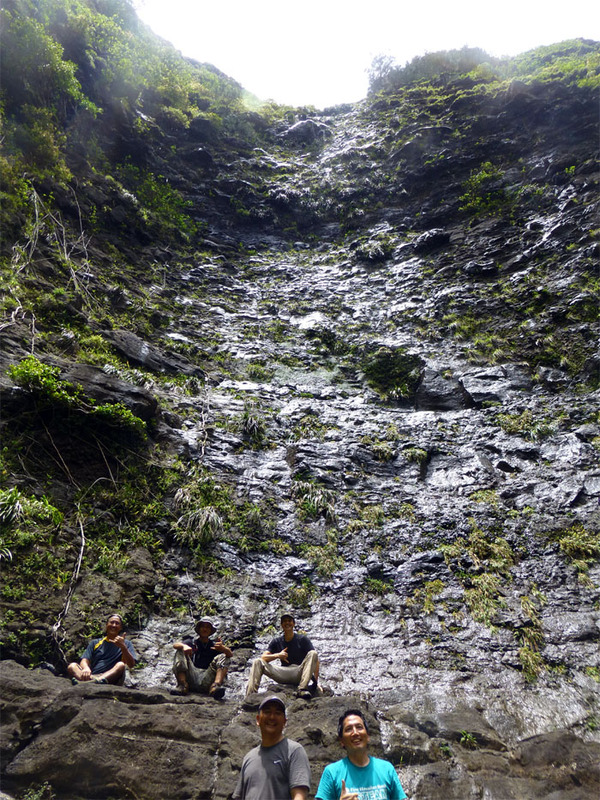 We contoured and climbed to the right to continue to the next waterfall. Walking upstream on sometimes slippery rocks. 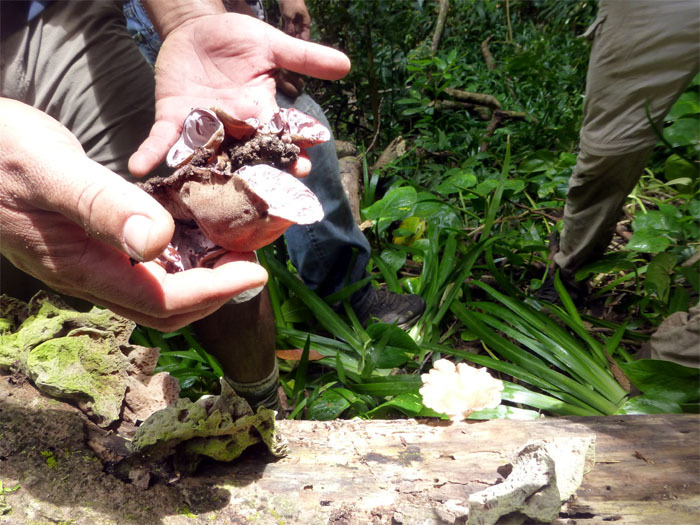 If you’re not sure-footed, it would be good to invest in a pair of tabi’s or reef walkers that provide a solid grip on wet rocks. 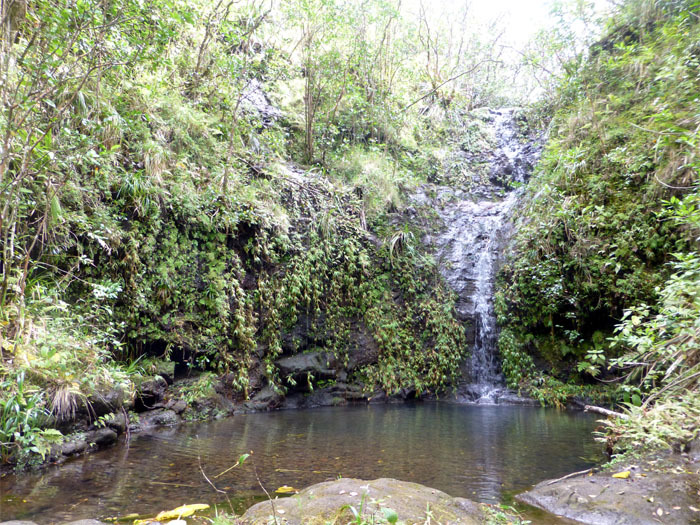 The seventh waterfall. 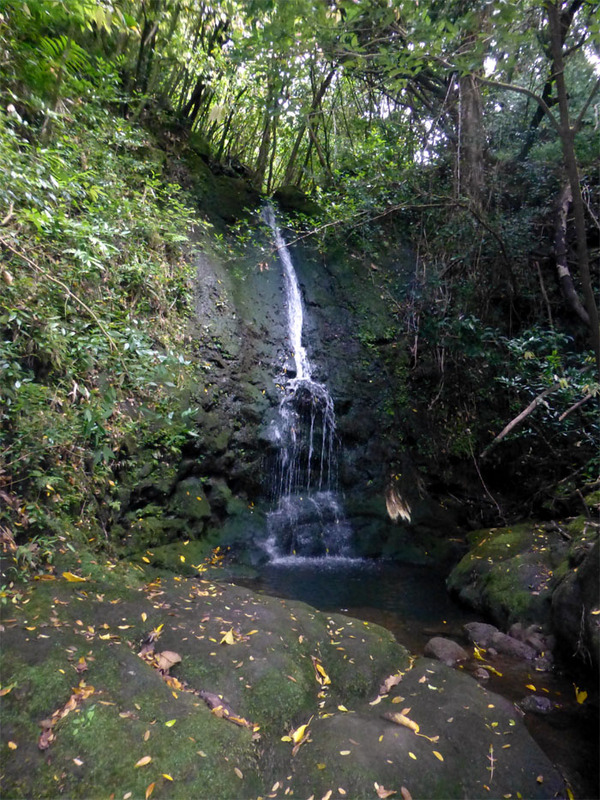 I heard that there was an eight waterfall further ahead, but it was mentioned that it was nothing to look at. 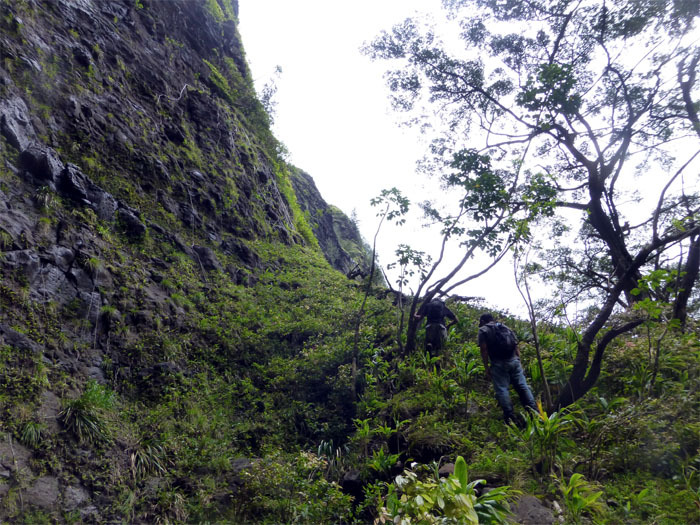 If one is feeling more adventurous, you can actually climb all the way to Lanihuli. Not today. Going back into the tunnel and coming out on the other side, we met Chris again who had stopped at the second waterfall before turning back. The entire hike was a little over 3 miles that was done in 3 hours. We were not done yet! Still had another waterfall to explore – Waipuhia Falls. Armed with GPS tracks and information, since none of us had ever done this hike, we drove up to the Pali Lookout and parked on the road going to town. 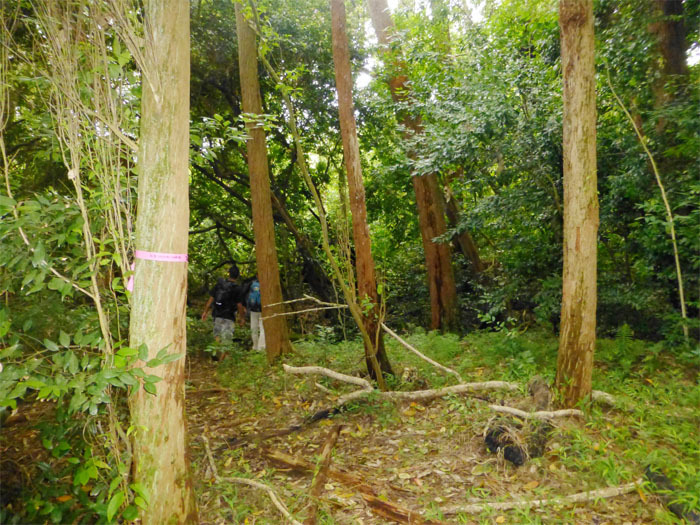 We followed the trail deep into the forest. A leftover from this past Easter? 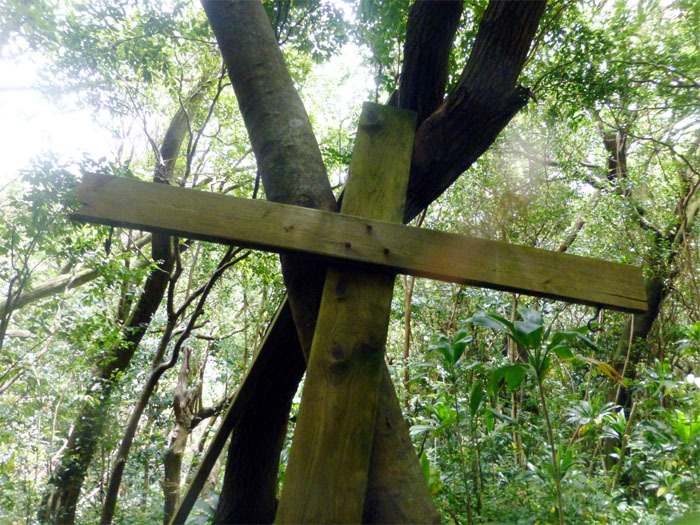 I don’t know if somebody was trying to drag this huge cross to the falls, gave up and left it here? We arrived at the barely moist Waipuhia Falls or Upside Down Falls. It would have been something to see, if the falls were flowing and the wind was catching it and tossing it back upwards. Not today. We climbed up the hill to our right to check out more of the scenery. It’s always neat to see the contrast in terrain, the hill we had just gone up was carpeted with grass and low lying plants. 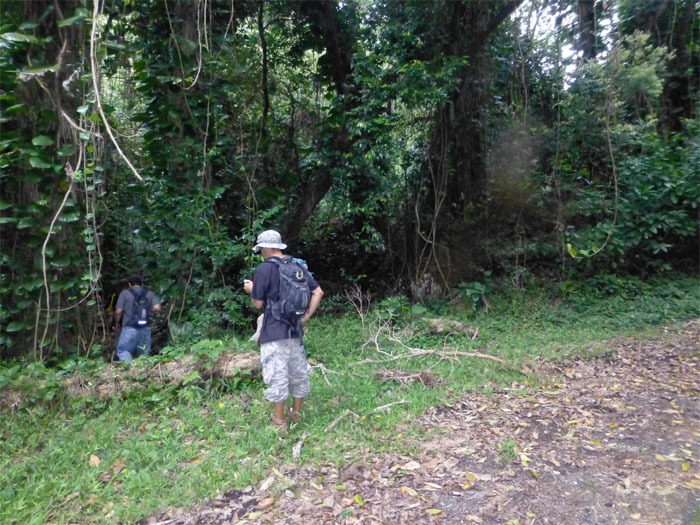 The other side of the hill going down was mostly barren of grass but heavily forested with trees. Coming back, Tom under the expert advice of Nate, picked some wild mushrooms from the forest for his stir-fry dinner later tonight. The entire hike was under a mile and took us a little over an hour to complete. 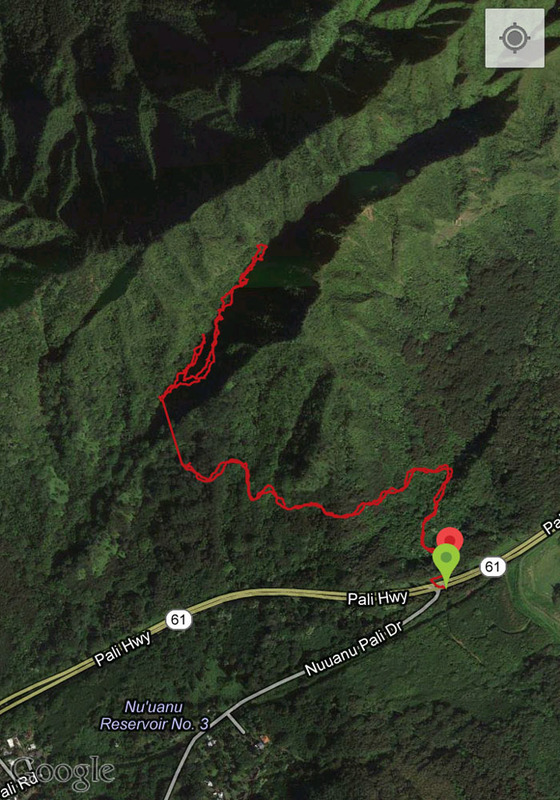 We had Thai for lunch and was going to cap the day with a short hike up the Pali Notches. 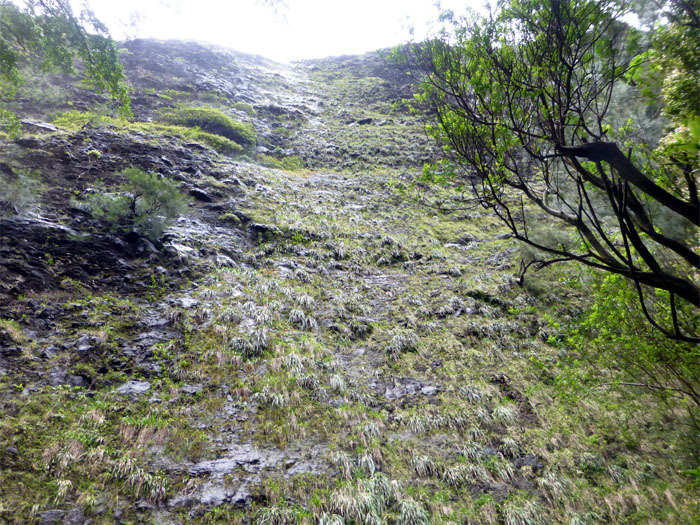 Mother Nature decided otherwise as rain started falling on us as we parked at the Pali Lookout. It was still a good day. Wow….amazing falls. May I please have directions for the 2 hikes especially upside down fall. Thank you very much. Okay will send you the tracks shortly. 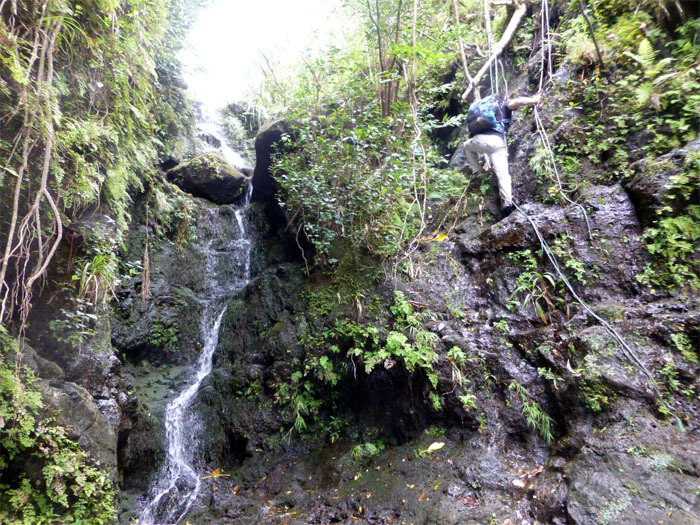 The only really difficult one to find is the upside down falls, the mo’ole falls is for the most part pretty easy to find. 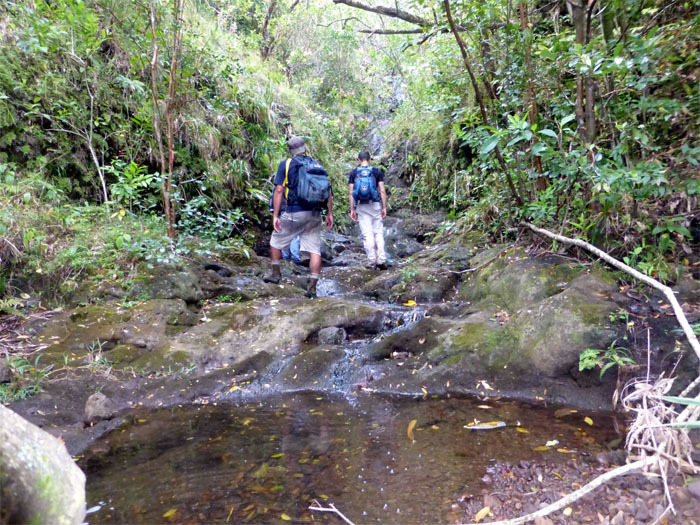 Thank you for sharing your pictures and information on the Mo’ole and Waipuhia Falls- I would appreciate the directions or tracks! Can you send them to me? Thanks for visiting my blog. I’ll email some info, but keep in mind that tracks and directions are not set in stone as the terrain constantly changes. Stay safe and have fun. Hi Kenji! Have you been back here recently? Was interested in going later this week. Wonder how much the trail has changed. Do you mind emailing me some directions and tips? 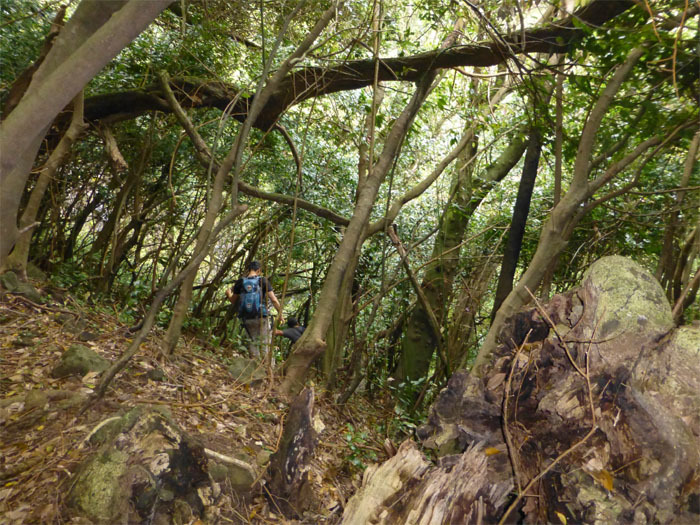 I have not done this hike , especially Waipuhia falls, since this posting. 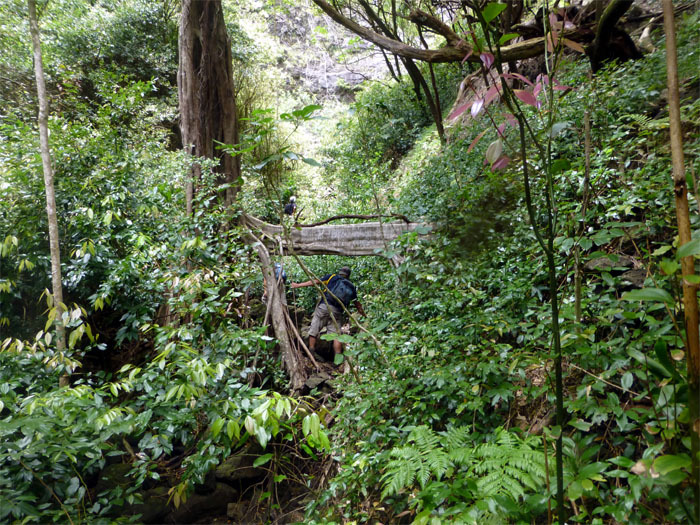 I heard that Mo’ole Falls was swept by heavy winds recently and the trail is a mess. I can send you the tracks for the Waipuhia Falls. Be safe and have fun. Happy Aloha Friday! 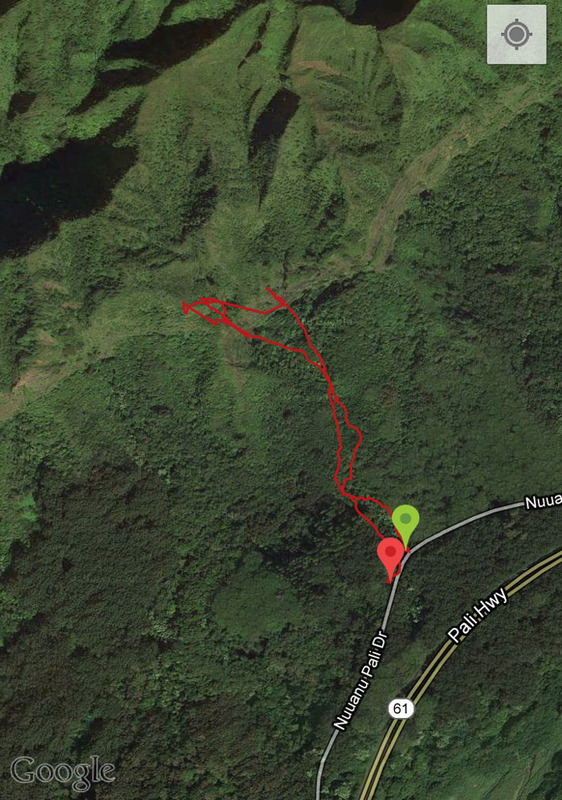 Would you mind sending me directions and tracks for the Waipuhia Falls hike? I’m planning this for tomorrow if possible. Also, would you rate it “easy, moderate, or hard”? I’m assuming easy but would like to take my 8 year old and wanted to verify. Mahalo!! Aloha Kenji. Big fan of your blog and posts on Facebook. 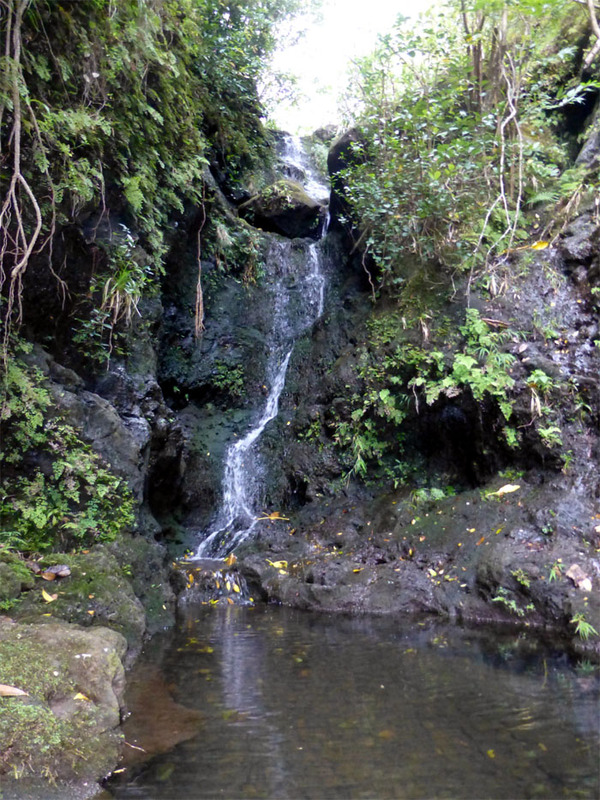 Would you please (like everyone else) share your info and tips for waipuhia falls. Mahalo in advance. Thanks. I will email you the track and info to your email shortly. Stay safe and have fun. Mike, id really like to try the hike. Can you drop me the track. I will send the tracks through email. Hope it helps and have fun.